Investors may not be aware that there is a VIX volatility index that measures expected volatility (and fear) for the Nasdaq-100. Currently, investors fear a Nasdaq breakdown much more than an S&P 500 breakdown. In fact, fear is at a 5-year extreme. Here’s an intriguing phenomenon: Since March 14, the S&P 500 VIX (Chicago Options: ^VIX) dropped 19.1%. The Nasdaq-100 VIX (VXN) lost only 4.2% (see first chart). Since March 19, the S&P 500 VIX is down 4.7%, while the Nasdaq-100 VIX is up 11.5%. Just like the S&P 500 VIX, the Nasdaq VIX is a measure of expected near-term volatility. This short-term divergence suggests that investors are more concerned about a possible Nasdaq (Nasdaq: ^IXIC) breakdown than an S&P 500 (NYSEArca: SPY) breakdown. But is this diverging of expected volatility significant? 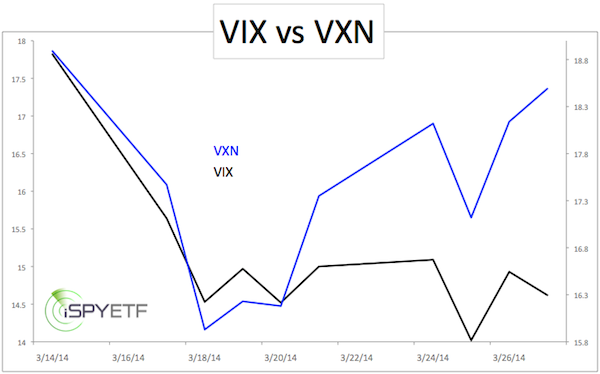 To make the divergence between the VIX and VXN easier to visualize I’ve calculated the VXN/VIX ratio. 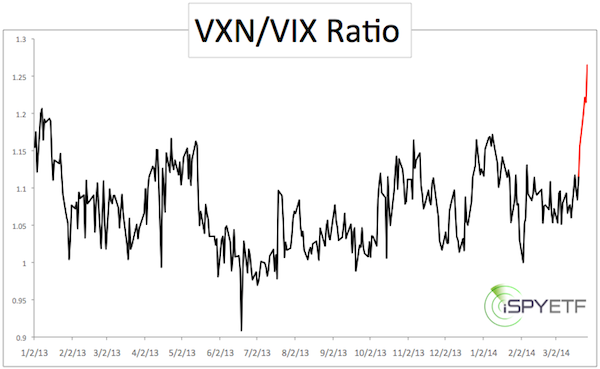 The VXN/VIX ratio just spiked to 1.26, the highest reading in 2014 and 2013. In fact, 1.26 is a 5 ½-year high. We haven’t seen too many extremes in the past few weeks, so I wanted to see what effect large VXN/VIX spikes (basically a ‘risk off’ signal) have on the S&P 500 (and Nasdaq). The conclusion is quite enlightening. A chart plotting the VXN/VIX ratio against the S&P 500 (going all the way back to 2006) along with what it means for stocks going forward was featured in yesterday’s Profit Radar Report. Up then down and making everybody frown. That’s been the stock market’s pattern since the beginning of the year. As the worst week of the first quarter is coming to an end, we’ll venture a short-term S&P 500 outlook. The stock market’s action has been messy. 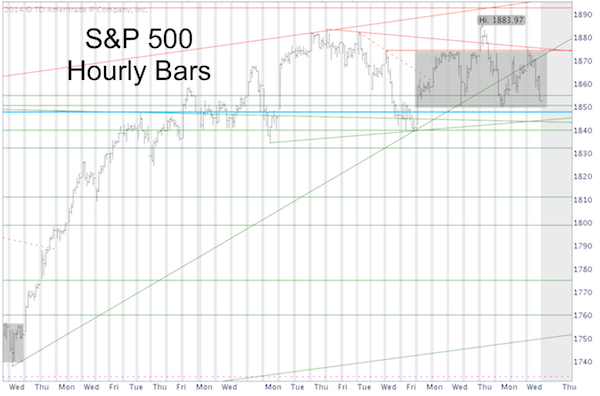 The S&P 500 (SNP: ^GSPC) chart shows a lot of overlap along with false breakouts and false breakdowns. This has created a lot of technical support (and resistance) levels. There are two support clusters. The first support cluster is around 1,825 – 1,840. The second support cluster is around 1,790 – 1,810. The March 21 rally was the most recent fake breakout (red arrow). Morning trade pushed the S&P 500 to a new all-time high, followed by persistent selling. This particular ‘Elliott Wave count’ mentioned in the March 21 Profit Radar Report projects lower prices, but the S&P 500 will have to move below the 1,840 support cluster to unlock lower targets. 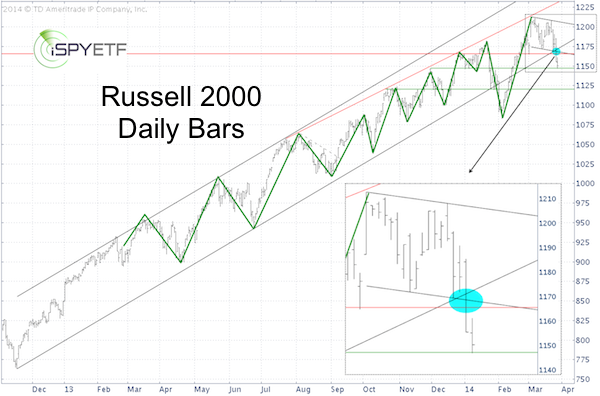 For the last few days, the Russell 2000 has been our ‘canary in the mine.’ The Russell 2000 captured our first down side target yesterday (view article here: Russell 2000 Captures First Down side Target). As always, when a target is reached, there’s an above average chance of a reversal. S&P 500 resistance is at 1,866 – 1,870. Various indicators suggest new all-time highs eventually. The question is whether we’ll see a deeper correction before that. The Russell 2000 chart provides a very unique glimpse at the market’s structure and how past performance may influence future price action. Here’s a closer look at the Russell and its effect on the broader market. The Russell 2000 (NYSEArca: IWM) has been moving higher one leg at a time within a well-defined trend channel for over a year. As highlighted yesterday in the Profit Radar Report, the Russell 2000 sliced below triple support and continued lower today until it hit support and captured the first down side target. Unlike the Russell 2000, the S&P 500 closed within its trading range yesterday. 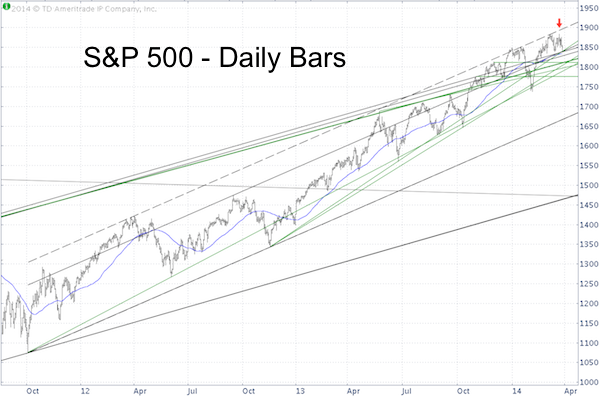 The S&P 500 (SNP: ^GSPC) chart below shows the S&P 500 as of yesterday’s close. How much more down side? Here’s where the stair-step ascent makes pinpointing a down side target tricky. Every prior high and prior low may serve as support and spark a rally. The Profit Radar Report monitors technicals, seasonality, and sentiment to identify high probability support levels. The Most Bearish Week of Q1 is Almost Over – What about April? Is Investor Sentiment Bullish Enough for a Major Market Top? The QE bull market is now over five years old. According to some, its recent structure also resembles the 1928 ‘last gasp’ before the Great Depression hit. There’s reason to look for a correction, but is sentiment bullish enough for a major top. Excessive optimism is generally bad news for stocks. That’s why sentiment analysis can be a helpful tool in spotting (major) market tops. There’ve been a number of commentaries suggesting an impending bear market (either because today’s market allegedly mimics the 1928 market or simply because this QE bull is getting old). 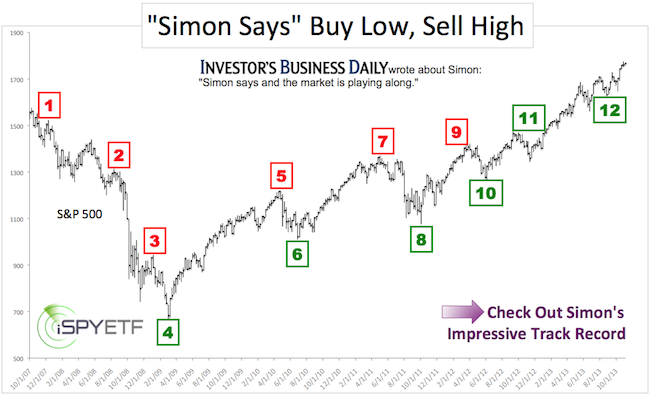 Does investor sentiment point towards a major top? The Profit Radar Report always looks at the ‘3 pillars of market forecasting.’ 1) Technical analysis 2) Sentiment analysis 3) Seasonality & cycles. We saw a number of sentiment extremes in December and January. That correction came and left. It also reset sentiment. There are no extremes, at least not the kind that point towards a major S&P 500 top. However, the green lines highlight an intriguing divergence between the S&P 500 (NYSEArca: SPY) and VIX. Normally the S&P and VIX move in opposite directions. But since mid-February they’ve moved in the same direction. This is unusual and unsustainable. Either the VIX or S&P 500 has to break down to restore the historic correlation. There’ve been two recent cases where the S&P and VIX moved in the same direction. Both had the same outcome. This is a good news, bad news kind of scenario. The bad news: The last week of March is one of the worst weeks (seasonally speaking) of the first quarter. The good news: The worst week is almost over. Now what? ‘Triple Witching’ (when stock options, stock index options and stock index futures expire) is often a turning point for stocks. This statistic is based on the performance of the S&P 500 tracking ETF (NYSEArca: SPY) since its inception in 1993. Looking at seasonality, based on the S&P 500 since 1950, paints the same picture. All three seasonalities show pronounced weakness in late March. 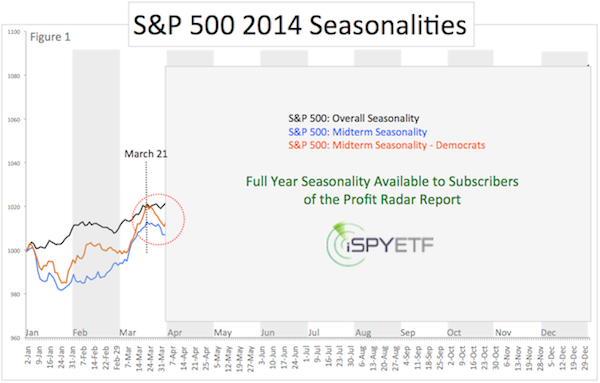 A full 2014 seasonality calendar is available to subscribers of the Profit Radar Report, but here’s a look at an index that sports a real unique telling pattern. Here’s a myth that just won’t die: As copper goes, so goes the economy. For those who believe that’s true, there’s hope. 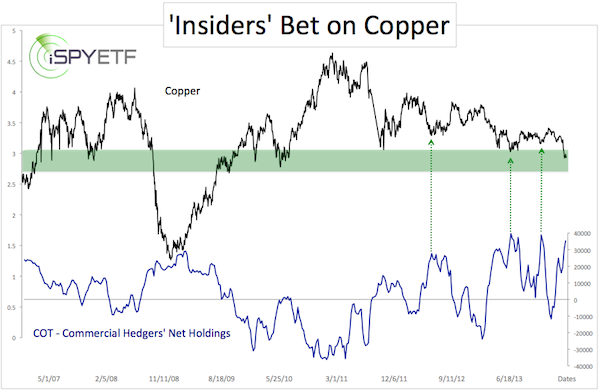 Insiders have rarely been as motivated to own copper. Here’s what it means for copper prices and stocks. “Copper awaits further decline on global economic worries” was one of many copper-related headlines on and around March 18. Financial reporting makes it appear as if anything ‘Dr. Copper’ does has either an effect on the economy or the S&P 500. We’ll show later that this isn’t the case, but there’s hope for all the ‘sell everything because copper is down’ doomsday sayers. Why? Because the smart money is gobbling up copper. The chart below plots copper prices against the number of copper futures contracts held by commercial hedgers (data source: Commitment of Traders Report – COT). Commercial hedgers include copper miners and distributors. They are considered the ‘smart money’ because they are actually involved in the copper trade. Commercial hedgers have rarely shown more desire to own copper. 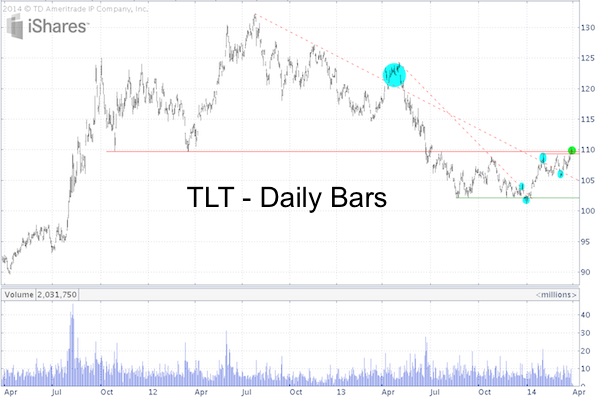 That should be good for copper prices, as long as support holds. What does this mean for stocks in general and the S&P 500 (SNP: ^GSPC) in particular? Here is a detailed analysis of the correlation between the S&P 500 (NYSEArca: SPY) and copper, along with an important near-term support level for copper: Is Copper Really a Leading Indicator for the S&P 500?